Raipur: In the autumn of 2007, a suave, middle-aged man with a military bearing walked into Naresh Bazaar cloth store near the Bilaspur bus stand and bought a thousand metres of olive green tericot fabric for Rs. 101 a metre. According to a shop assistant, the man looked like an ex-serviceman, spoke in English, introduced himself as Sunil Choudhury, a private security contractor with contracts to secure factories across Chhattisgarh, and said he needed uniforms for his guards. It appears that Choudhury liked Sahu’s work; when the Raipur police raided the workshop in early 2008, they claim to have found 634 metres of military green cloth, 200 trousers and 107 full-sleeved shirts. Sunil Choudhury, the police said, was not a security contactor but was Katta Ramchandra Reddy alias Vijay alias Gudsa Usendi, a high ranking member and spokesperson of the Dandakaranya Special Zonal (DKZ) Committee of the banned Communist Party of India (Maoist). The uniforms were meant for Maoist guerrillas rather than private security guards. Maoist spokespersons have long had a fascination for aliases. Before he was slain in a police encounter last year, Maoist central committee spokesperson Cherukuri Rajkumar was known to the outside world as Azad (translated as Free), but within the party he went by several names including Madhu, Gangadhar, Uday and Dinesh. His successor goes by the name of Abhay (translated as Fearless); the spokesperson who handled the abduction of Malkangiri District Collector R.V. Krishna in February went by the name of ‘Prasad,’ but Dandakaranya’s Gudsa Usendi is different, because Gudsa Usendi was once a ‘real’ person. When he joined the Maoists, Gudsa Usendi dropped his given name and took on the moniker of ‘Ramesh.’ He was of the Maria tribe from Chhattisgarh’s Abujmarh region, according to the Maoists. A year after his death, the Maoist spokesperson of Dandakaranya (broadly corresponding with South Chhattisgarh) took on his name to keep his memory alive and the practice has continued ever since. The Maoists are wary of sharing organisational details with reporters, but anecdotal evidence suggests that Gudsa Usendi functions at the centre of a cloud of cell phones, laptops and individuals. A message from Gudsa Usendi could appear as a note under your door, a letter postmarked by a small town on the Chhattisgarh-Andhra Pradesh border, an email from an IP address that traces back to a neighbouring State, or a micro-SD card stuck to a sheet of paper. In a recent meeting, a member of their communications team explained that every Maoist division (equivalent to a zilla in the panchayati sytem) has access to a laptop, memory cards, a portable inkjet printer and a cell phone. The netbook examined by this correspondent ran an open source Linux-based operating system with open source text, image and video editing software. Gudsa Usendi usually prepares a press note and hands it over to one of his assistants. Major press releases (like the announcement for Martyrs Week) are designed using crack versions of software like Adobe Pagemaker and converted into PDF format, before being sent to printing presses installed in secret locations. The Maoists are keenly aware of the connection between surveillance and communication. In the forests, only certain senior cadres are allowed to carry cell phones and use their devices sparingly. “We have to secure an area and post sentries before making a phone call,” said a Maoist commander who carries a Nokia phone. However, the poor density of cellular towers in Maoist territories makes it hard to pinpoint the location of a particular phone. On a windy day in Konta in Chhattisgarh’s Dantewada district for instance, it is possible to pick up reception from a tower in Andhra Pradesh’s Khammam district; by moving 50 km northwards from the same spot in Konta, a user can start ranging towers in Orissa’s Malkangiri district, moving further towards Chintrakonda in Malkangiri, the Andhra network comes back into range. Somewhere in that broad stretch of land, a man climbs up a tree, pulls out a cell phone from the folds of his clothes and makes a phone call. “Hello? I have a statement from Gudsa Usendi,” he says. A deafening silence from the government has greeted demands for an independent probe into the death of Chemkuri Azad Rajkumar after reports in Outlook and other media raised serious questions about the police encounter. The post-mortem indicated death by a shot fired at point-blank range. When Outlook took the post-mortem report to independent experts, not saying it was of Azad, they concurred with the earlier finding that the wounds and other signs indicated death from a shot fired from “less than 7.5 cm” away. Azad’s death is not the death of just any Maoist leader. Some may say the state is well within its rights to kill the leader of an armed rebellion, but his death could well perpetuate a conflict without end. “I don’t think people have fully grasped the true significance of the killing of Azad. There have been killings like this before in Andhra Pradesh. Fake encounter killings have a fixed format. They just change the name of the person killed. So why should it be any more or less significant in Azad’s case?” asks Arundhati Roy. The writer-activist, who has spent considerable time with the Maoists, reporting on them, says Azad’s death indicates “the government desperately needs this war to clear the land and push ahead with what it wants to”. “Azad,” says Arundhati, “was the man deputed by the Maoist party to represent them in the proposed peace talks. For the police to kill him in this way, and for the Union home minister to refuse to take cognisance of this extra-judicial killing, tells a great deal about the government’s real attitude towards the peace talks.” The hundreds of MoUs signed by the government with corporates “are waiting to be actualised. The government wants to escalate this war to sort out what it views as a problem. Peace talks would interfere with the momentum and be an unnecessary impediment”. But Union home secretary G.K. Pillai rejects any calls for an independent inquiry into Azad’s death (see following interview). While Pillai supports the state government’s version of the encounter, the state’s dgp, R.R. Girish Kumar, reiterates “whatever allegations made by Maoists or their frontal organisations are baseless”. The Maoists, he says, are taking some point in the post -mortem report and trying to blow it up in a disproportionate manner. “The allegations on the post-mortem report contents are not true,” he says. Kavita is clear that as a first step, “the Supreme Court should uphold the Andhra Pradesh High Court order of 2009, which states that every encounter killing must be investigated. That will have far-reaching implications on such killings. Having done that, the apex court should suo motu take note of such killings and order a judicial inquiry. Parliament must also legislate to check such killings by the state.” That may not happen in a hurry. In Azad’s case, “two FIRs should have been registered by the police. In this case an FIR has been registered against the man who was killed by the police. It’s like the police are the judge and the jury and Azad is the accused person. It’s a travesty of law,” says Supreme Court lawyer and human rights activist Colin Gonsalves. He, too, draws attention to the Andhra Pradesh High Court order of 2009, which clearly stated that an FIR has to be registered in case of an encounter killing and this is the law of the country. But with the Supreme Court granting a stay on that judgement following an appeal by the Andhra Pradesh government and its police, encounter deaths continue to remain outside the pale of an independent inquiry. So, ironically, while it seems to be good in law to gun down a man in cold blood, it conveys the impression that it is bad in law to order an independent inquiry into such executions. 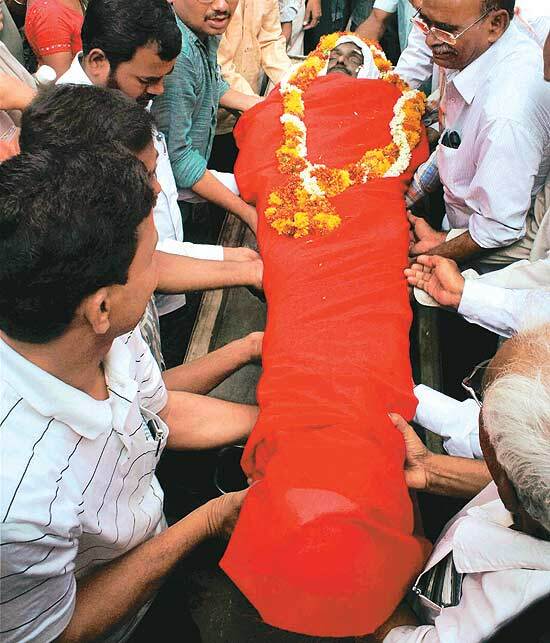 Comrade Azad, spokesperson for Communist Party of India (Maoist), was murdered on July 1st 2010. Let us honour his memory and continue on his path! Comrade Azad was a member of central committee and also a member of the politbureau of the Communist Party of India (Maoist). His death is a big loss for the CPI (Maoist), the Indian revolution, the revolutions of the region, and also the global revolution. He would have played a very critical and decisive role at the current juncture: at a time when the reactionary Indian state on one hand has mobilized more than 250000 police and mercenary forces against the Maoist peoples war within the framework of a large military campaign called Operation Green Hunt, and on the other hand it is espousing a deceptive propaganda about “peace talks” and “ceasefire.” His murder at the hands of Andra Pardesh’s special forces, and that even in another state, which is even illegal under the laws of the Indian state, illustrates the fact that the reactionary state is using the false propaganda around “ceasefire” and “peace talks” as a façade for hiding its anti-people brutal repression and for this purpose they would even break their own laws. The resistance of the masses under the leadership of CPI (Maoist) against “Operation Green Hunt” that spreads across twenty states out of 28 Indian states is a resistance against the comprador policies of the reactionary Indian state which is making possible the vast plunder and pillage of the natural resources of India by multinational corporations. In the process of the ongoing resistance, which continuously expands and spreads, the masses of people are selflessly giving sacrifices and also give tough blows to the vicious and repressive forces of the reactionary state. The officials of the reactionary Indian state and at its helm the Prime Minister, Manmohan Singh, since the last few years is continuously declaring that the Maoist peoples war is the biggest threat to the Indian state. The armed struggle and the current peoples war in India that is being led by CPI (Maoist) is the continuation of the Naxalite uprising that began a few decades ago in that country. Now this revolutionary war has spread across the vast and populous country and directly affects the lives of hundreds of millions of Indian masses, the martyrdom of comrade Azad, as one of the central and top leaders of the movement is considered an important success for the reactionary and atrocious Indian armed forces. But, among the hundreds of millions of the revolutionary Indian masses, there are many more `Azads’ and many other `Azads’ will join the battle. The people’s war in India can and should successfully overcome this loss and continue ahead until the total victory of the revolution. Communist (Maoist) Party of Afghanistan on the path of struggle for starting the peoples war in Afghanistan, whose specific character at the current juncture is the people’s revolutionary national war of resistance against the imperialist occupiers and their puppet regime will commemorate comrade Azad and expresses its solidarity with CPI (Maoist) and the peoples war in that country on the occasion of this loss. The assassination of Cherukuri Raj Kumar a.k.a Azad on July 1-2, 2010 killed a senior leader of the CPI (Maoist) and scuttled a peace process thus virtually destroying the hopes of millions of Indians who wanted the government offensive against the Maoists to be halted. In this sense it was a double killing. We were encouraged by the news reports that the Union Home Minister had written to Swami Agnivesh on May 11, 2010 to explore the possibility of a 72 hour ceasefire to pave the way for talks between the Maoists and the Indian State and the letter sent by Cherukuri Rajkumar a.k.a Azad, on 31st May, 2010 reiterated that Maoist party was serious about talks. In particular, unlike in the past, party’s response was unambiguously positive. Azad wrote that “to ensure the establishment of peace there should be ceasefire or cessation of hostilities by both sides simultaneously instead of asking one side to abjure violence … lift the ban on the party and mass organizations so as to facilitate them to take up open forms of struggle …. initiate measures to release Party leaders as a prelude to the release of political prisoners …. and …. stop all its efforts to escalate the war including the measures of calling back all the para military forces deployed in the war zones.” Indeed even in his interview given to The Hindu (April 14,2010) he had stated in response to the question whether by engaging in talks the Maoists wanted “to buy time” or is it a “re-evaluation of political strategy” he had been candid. He had said that “it does not need much of a common sense to understand that both sides will utilize a situation of ceasefire to strengthen their respective sides.” But he pointed out that “talks will give some respite to the people who are oppressed and suppressed under the fascist jackboots of the Indian state and state-sponsored terrorist organizations…”. In the same interview he also reminded that it was the “imposition of the ban that had led the Party and the mass organizations to take up arms in the first place…….What shook the rulers at that time (in 1978) and compelled them to declare Jagtyala and Sircila taluks in Karimnagar district of North Telengana as disturbed areas in 1978 was not the armed struggle of the Maoists (which had suffered a complete setback …by 1972) but the powerful (movement against) anti-feudal order in the countryside….” In short the manner in which the party responded this time further inspired hopes in the possibility of ending the war. Granted that hope generated about prospects of talk had weak foundation. No political party in government power has ever shown willingness to engage in sincere dialogue with the revolutionary left. This should caution us against raising our hope. The 2004-05 peace talks between the Maoists and the Andhra Pradesh government ended because fake encounters continued to be carried out by the AP police and so did Maoists retaliation. Thus even before substantive issues could be taken up talks got sabotaged and AP police crackdown ensued which dealt a severe setback to Maoists in AP. However, we also know that sooner or later both sides have to talk. The assassination of Azad on July 1-2 has made the already difficult task bleak. It is evident from facts available in the public domain that Cherukuri Raj Kumar a.k.a Azad and Hem Pande were unarmed when they travelled to Nagpur where Azad was to meet a courier between 11.30-1.30 pm of July 1, 2010. They left on June 30th from somewhere in north India and were disappeared most likely on the morning of 1st July either before the train reached Nagpur or on reaching Nagpur. It appears that he was on his way, among other reasons, to meet other senior leaders of CPI (Maoist) to decide on the date from which 72 hour ceasefire was to commence. Swami Agnivesh had communicated to him on June 26 that “Maoists should set a date for abjuring violence for 72 hours. In my letter I had suggested three dates: July 10, 15 and 20. Before he could respond, the police killed him.” (The Sunday Times, 18 July, 2010). It is alleged that Azad was killed because the Maoists did not cease their ambushes causing fatalities which demoralized security force personnel, such as the June 29 ambush in Narayanpur district of Bastar in which 29 CRPF jawans lost their lives. While ceasefire had not commenced and both sides were engaged in attacking each other it is one thing for such attacks and counter-attacks to continue. However, the greyhound which kidnapped Azad and then killed him were aware of his identity (but not of his companion) and therefore knew that he was engaged in talks with the government. They could have either allowed him to travel or else to arrest him and his companion. The fact that they chose to do neither meant that they had sanction to liquidate him. And therefore, it is likely that the AP greyhound knew that by doing so they would be scuttling the incipient peace process. After this it would be difficult for Maoists to heed the demand for cessation of hostilities if a leader engaged in these backchannel contacts can be eliminated. Because it sends a message that no one is safe at the hands of trigger happy security forces. On the other hand it imperils the efforts of all those who wanted to end this war from escalating. From circumstantial evidence it is clear that warmongers have won this round. The July 14th 2010 meeting of the chief ministers of Naxalite-affected states makes it clear that the Indian government post-Azad assassination is going ahead with escalating its war efforts. For instance it was announced at the meeting that 36 battallions of India Reserve force will be added to the 105 already raised along with 16,000 more Special police officers (SPOs – civilians trained and armed by the government to combat Maoists) bringing their strength to 30,000. However, this falls short of the numbers touted by no less than Union Home Secretary who told Economic Times (April 19th, 2010) that “our (armed) police requirement today is roughly three and half lakhs short….we want to reach the UN average and to get to it I need another five lakh policemen. So we need to recruit eight lakh over next five years…” or 175,000 jawans annually. Also in order to prepare the way for army deployment four unified commands are being setup headed by the chief secretary and with a retired major general as an advisor. Indeed the army chief, two days after the meeting of the CMs, told his senior officers to be “mentally prepared to step into the fight against Naxalism….It might be in six months or in a year or two but if we have to maintain our relevance as a tool of the state, we will have to undertake things that the nation wants us to.” (Indian Express 17 July 2010). This may persuade some to question the political strategy of the Maoists and blame them for widening the war. This would be a grossly erroneous exercise. To essentialise the issue of Maoist violence is the way in which class society dehumanizes struggles and movements. If the bottomline is that reproduction of social inequality is unacceptable then those who believe in step-by-step process, and others in leap or qualitative jump, from one stage to another, must accept that there will remain a divide and yet both are also symbiotically linked to each other. Those who decry armed struggle claim that popular movements can make existing institutions responsive to people’s needs. The point is such efforts were being made even when Maoists had not emerged as the biggest threat to the Indian ruling classes and have not ceased because of Maoist rebellion. Except such efforts have actually gained more leverage thanks to the Maoist movement emerging strong. This becomes even more remarkable because in 2004-05 when Maoists were dealt a blow in Andhra Pradesh and more or less wiped out with mere presence in a single district followed by Salwa Judum type repression in Chattisgarh. No one believed that they would emerge stronger this time around. Well they did. So much so that almost all the contemporary social welfare legislations, be it NREGA, Forest Act, enforcement of PESA, proposal to make joint forest management committees managed by the gram sabha…and the Planning Commission’s “Special Problems of Tribal Development” have all been inspired or advocated by referring to the need to wean away the poorest among the poor from the Maoists/ Naxalites? Consider that the Prime Minister had drawn attention to the need to withdraw lakhs of cases filed against the tribals for petty crimes, since 1980, lest such persecution of tribals drive them to join Maoists/Naxalites. The union law minister had opined that “(t)here is a feeling among the common citizens, especially the poor, women, the elderly and the weaker sections, that the legal and judicial process is far removed from them.” He added that common man’s disenchantment was manifesting itself in “new form of violence and strife – civil unrest, armed peasant and tribal movement, Naxalite and Maoist rebellion.” (HT 25/10/2009). One can go on and on…. Thus even peaceful or non-violent movements owe their credibility or their relative effectiveness to the Maoists armed resistance. Then why should anyone decry Maoists for their armed resistance or want them to stop the war when resistance itself derives succor from this? It is important, I believe, to keep exploring possibilities of peace which can enable the Maoists to work openly and launch mass struggles because they have captured the imagination of the poorest among the poor. Moreover, while violence will continue to play a role, as long as State pursues militaristic approach, violence also has its limits. These limits are set by politics. It is one thing to resist but another to promote alternative politics. While displacement, land grab by and for mining and mineral based conglomerates, forest rights, welfare needs have received spotlight, alternative to the present order of things is somehow missing. Why is it that ten thousand suicides by farmers evokes less revulsion than a criminal act committed by the Maoists? Consider that received wisdom which regards prospects of agriculture playing a role in the growth process to be negligible, particularly, from the viewpoint of employment generation and as driver of economic growth. What does the revolutionary left, in particular the Maoists, have to offer to reverse the decline of agriculture, which accounts for livelihood needs of 60% of the rural workforce? Do we not need the alternative and not just a critique of this received wisdom. Will land reform/distribution invigorate production and generate employment? On the other hand if manufacturing is the key sector to bring about equitable development is it to be an unbridled growth or be planned? Wherein should investments go? What should be the mineral policy? Should we, for instance, halt mining of bauxite? Why must it be the case? Do we need poverty reduction so that state can play benevolent role? Or is there an alternate vision for removal of poverty and empowering the people? How is it that decade long military suppression in NE and J&K does not encourage us to ponder the nature of our State which can year in and year out crush movements which demand right of self-determination, an eminently democratic and peaceful approach? Is the Indian state anti-Muslim, pro-Hindu, racist….or a repressive state which presents itself as one or the other depending on which section of people it is engaged in crushing and therefore demonizing. The point is that for left to be credible it must go beyond surface manifestation of wrong and address the underlying causes and processes which account for skewed and unequal and stunted growth. Regrettably, parliamentary left despite 58 years of open politics and despite holding government power at provincial level, has not offered an alternate vision. Yes they have some achievement but these are hardly of the kind which inspires anyone to claim that they present a different vision of politics. While their failure does not cancel out open politics what it does is reminds us of where we fail and what we lack. Now Indian State propagates that Naxalites are irredeemably bent upon waging a war against the Indian State and short of suppressing them there is no other option. Of course Maoists want to seize power. That is a perfectly legitimate objective. In the last four decades several Naxalite parties gave up this path to pursue non-violent parliamentary or extra parliamentary struggle. Their experience hardly inspires confidence that the Indian state has become amenable to people’s concerns now that some of these left wing rebels gave up arms. Appeal and prospect of non-violence has been undermined, by the state itself. Lest we forget be it NREGA, the forest bill or the decision to enforce Panchayat Extension to Schedule Areas, which was passed in 1996 but not implemented and so many other such issues figure on the agenda thanks to the fear that were this not done the poorest among the poor will continue to turn to Maoists. The point is that so long as State monopolises means of violence they will remain enabled to subject people to a life of indignity and enslavement. Freedoms and liberties would remain prerogative of the middle classes to enjoy. Working people are vulnerable; no sooner they appear to have succeeded in mobilizing people and begin to question the inequalities and inadequacies of the system they become target of State’s oppressive ways. Therefore, it would be a recipe for disaster to surrender the right to offer armed resistance until such time that the State outlaws war against the people. Indeed unless people get armed one cannot neutralize the great advantage the ruling classes enjoy over means of violence, which is primarily employed against the masses. India, for all its verbosity about non-violence, is one of the most heavily armed state both in terms of accumulation of destructive power of its arsenal as well as size of its military force, which gets force multiplied by draconian laws, and thus enables the ruling classes to practice ‘slow genocide’. Consider that 45% of children below 6 years suffer from malnutrition, malnourishment and stunted growth, or that by playing around with calorie intake, bringing it down from 2400 to 1800 or even less to 1500, one can statistically reduce the number of people living below poverty line and thus reduce Food Security entitlement for hundreds of millions of Indians! This exposes our own people to a slow death. To then argue that violence has no role to play is quite wrong. It is as good telling people to wait patiently for the fruit to fall into their lap. This may be touching display of fortitude and of religious faith, but for the fact those at the receiving end may be getting desperate after 63 years of practicing it. Ironically, whereas India dropped to 134th position in global human development index we moved up the ladder, to occupy ninth position, in military spending and 12th largest economy! Take another example whereas 126,700 High Networth Individuals (billionaires and multi-millionaires) in India own one third of gross national income of the country, 645 million Indians suffer pangs of poverty and deprivation! Despite being weak and with patchy urban presence it is clear that Maoists enjoy legitimacy in the eyes of the poorest of the poor. Thus were the ban on the party removed they could emerge as a fulcrum around which resistance could become vigorous. Indian rulers do not want this to happen. By assassinating Azad security apparatus has thus killed a senior leader of the Maoist party, scuttled peace process and throttled the possibility of Maoists coming overground anytime in near future.